What does seronegative rheumatoid arthritis mean? Seronegative rheumatoid arthritis (RA) is a topic that brings a lot of confusion for the public, people living with rheumatoid disease, and sometimes even medical professionals. Put simply, seronegative is a term used to when there is an absence of an antibody that is usually found with a certain disease.1 The word has two parts: “sero” is just short for serum—or blood—where biological markers—or biomarkers—are usually measured. Of course, “negative” just means that none was found—that the test couldn’t detect a sufficient amount of a marker. Is seronegative rheumatoid arthritis a separate type of RA / RD? My doctors said my disease will be milder because I have seronegative RA. Can extra-articular disease happen with seronegative RA? Isn’t seronegative rheumatoid arthritis harder to treat? These are all good questions. But can you see an underlying assumption in these questions? 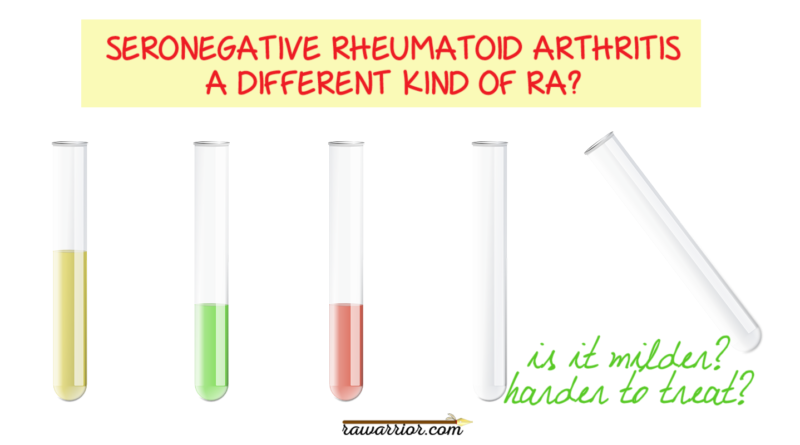 It sounds like seronegative rheumatoid arthritis is a different type of RA / RD. Sometimes seronegative disease is discussed like it’s an entirely different rheumatoid disease with different symptoms, treatments and outcomes. All rheumatoid arthritis / rheumatoid disease is diagnosed using criteria—in the US set by the American College of Rheumatology (ACR). The criteria are a list of items that count as points toward diagnosis. The criteria were updated in 2010, but as we have discussed here on the blog before, they tend to recognize later stage rheumatoid disease. Blood tests for biomarkers anti-CCP and Rheumatoid factor are both included in the criteria. Someone can be diagnosed with RA / RD by having “enough” points. A person who doesn’t have positive blood tests just has to get more points in another area—like swollen joints. Why are tests “negative” in seronegative rheumatoid arthritis? This is the important thing to remember—something I’ve probably typed a thousand times in comments or email replies over the years. “Seronegative” only means negative for the one biomarker that was tested. Many biomarkers have been found. Some of them we have tests for. But there are many more still to be identified. Someday it’s possible that no one would be told they have seronegative rheumatoid arthritis. Rheumatoid factor (RF) tends to be negative early on in the disease process. It tends to be higher later in the disease process. Saying “seronegative” used to mean negative RF, period. Nowadays, many doctors say someone is seropositive if they have antibodies to CCP (also called ACPA). And they should, since those are the most specific antibodies we have for RA / RD. People with seronegative disease have to get more points elsewhere since they don’t get points for blood markers. This study casts doubt on the historical belief that seronegative disease is a milder form of the disease. It is most likely, as I said, the very same disease, but with markers that we cannot test for yet. Have you or someone you know been diagnosed with seronegative rheumatoid arthritis? What questions did you have about this? Could you find answers? Today is the perfect day to talk about what rheumatoid disease really is! Tomorrow is the 7th annual Rheumatoid Awareness Day. To see all the action or get involved, visit rheum4us.org. Hint: cool video shorts & a HUGE matching grant to make our small donations count BIG! MORE ON BIOMARKERS: Coming up soon on the RPF blog at rheum4us.org, my immunologist daughter KB is publishing a short and easy 101 on biomarkers. 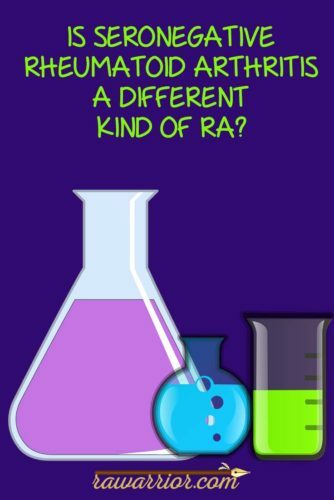 That will be a big help to everyone learning about seronegative RA. You should really subscribe there NOW anyway to get all the news on Rheumatoid Awareness Day! 2 Giacovelli G, Barbetta B, Vitalini C, Brambilla N, D’Amato M, Girolami F, Rovati LC. Comparison of Clinical Features of Seronegative and Seropositive Early Rheumatoid Arthritis: Blinded Data from the Ongoing Phase IIb Trial with the EP4 Receptor Antagonist CR6086 in DMARD-Naïve Patients [abstract]. Arthritis Rheumatol. 2018; 70 (suppl 10). https://acrabstracts.org/abstract/comparison-of-clinical-features-of-seronegative-and-seropositive-early-rheumatoid-arthritis-blinded-data-from-the-ongoing-phase-iib-trial-with-the-ep4-receptor-antagonist-cr6086-in-dmard-naive-patien/. Accessed January 26, 2019. I have had two severe cases of rheumatoid disease (RD) where there were no physical markers present. Numerous blood tests, X-rays, a CAT scan, neurologist appointments, and numerous rheumatologist appointments did not identify me as having anything out of normal. However, the pain was unbearable, especially at night. My arms, the bones in my arms, felt as if they were on fire. Since there were no physical markers, the prognosis was to “wait and see if any markers would turn up”, and this happened on both occasions. Oh, in my first bout with RD, I woke around 3 AM with both knees feeling like they were in a vise being crushed, and I had to use crutches to be able to move around. Only after I persisted in searching for information did I come to the conclusion that I had Polymyalgia Rheumatica (sometimes referred to as PMR), and I then “convinced” the rheumatologist I was seeing that this was what I had. He did relent and put me on a high dose of prednisone, and this quickly eased my pain. I was a participant in a Stanford University program for people with RA, and nowhere in the time I was involved was the subject of PMR broached, nor can I say I’ve seen it discussed in the RA Warrior information. I realized after my mother had passed away and I had gone through my second round of undiagnosed PMR that she also suffered from this, needlessly. I ask that PMR be more fully recognized and discussed as I see PMR as a seronegative rheumatoid arthritis. Even my current doctor does not hve my boughts with PMR listed in my medical charts “because of the lack of physical markers”. I can only wonder how many other people may have gone through or be going through boughts of PMR without being able to be adequately treated. Please put out more information on PMR to help anyone who may have this. I have seronegtive RD. After being tested several times my Ortho Dr. said that sometimes that happened but that I def. had RA. Since that I have had 3 other Dr.s confirm the same. I guess I’ve wondered did I have some other form of the disease that falls into the autoimmune list. One thing I do know is sometimes there are day’s where the pain and stiffness are almost unbearable and day’s that are better that I’m very thankful for but now I think it is attacking some of my muscles that get more sore than any workout or overuse has ever caused. Thank you Kelly for sharing and shedding new light on this topic. I was diagnosed with RA 18 yrs. ago and as seropositive, for several years. About 20 yrs. Later I lost my insurance for a while and had no care, had been on Methotrexate. After getting insurance again I had to get a new Rheumatologist due to mine leaving the state. At the new doctor I tested seronegative. She said “I don’t believe you have RA”, but had fibromyalgia. Next visit she told me the opposite. Frustrated, I gave up and stopped going. I deal with stiffness and pain daily and flares several times a year. It seems to me there needs to be better education of these “professionals” so there could be improvement in their care. I have had seronegative RD since 2012. I don’t seem to have the “flares” that many have, I just stay in a constant state of flare, constant pain, though I do have times when the pain & swelling are worse than others. Since the Vectra test came out, & I was first tested a couple years ago, I have tested in the moderate to high moderate activity range. My RF finally tested weakly positive a few months ago, and my CCP still tests negative. Thankfully, I had a rheumatologist who relied more on symptoms than test results, and a family Dr who really listened to me when I described my symptoms, and believed me, even when labs were negative, and still does. I’m currently only on an anti-inflammatory, and very lose dose prednisone as needed, as well as curcumin & fish oil supplements, & pain meds to help manage the pain. I’ve been on some of the DMARDS & biological, & has some fairly serious reactions & side effects, so we’ve been giving my body a break from them for over a year and a half. I can’t take TNF inhibitors at all anymore. So I’m toughing it out for now, because I don’t have a lot of options left at this point, & I’d rather save them for when things get really bad. Notice I said when, not if. My case seems to be progressive, not flares, and it’s likely I’ll get worse. I’m just happy to have doctors who listen to me, and treat appropriately, based on my symptoms, and my wishes. Seems like there are many out aren’t so lucky. In Oct-Nov 2007 I developed first symptoms. Positive ANA, suspect Crest Syndrome. Follow up with Rheumatologists who denied Crest and suggested considerable testing. Was always RF and CCP negative. All other testing was negative for original suppositions. CRP continued to elevate to 99, sed rate also very elevated. Joint pain and swelling, non funtional hands that were swollen, painful and stiff. February started on a week of steroids to observe changes in hands, pain improved but hands still swollen and no change in function. By March was started on methotrexate with initial diagnosis of inflammatory arthritis. At year point I asked Dr. What was my diagnosis, his teponse was “acts like and responds like rheumatoid arthritis, so it’s rheumatoid arthritis.” Have been treated as such since. Have added and changed drugs through methotrexate, Humira, now Arava and IV Orencia. After 30 years I still have conflicting views on diagnosis from rheumatologists. I was seronegative in 1989 although both hips were replaced in 1990 after both turning (I had extreme ESR and symptoms) both revised since and left knee replaced and revised a few years ago. I just can’t face another major surgery to have the right knee done so live with it being bent and sore. I have been on methotrexate since 1991 with various DMARDS, and prednisolone for 8 years which is it’s own nightmare. I did have 10 years remission early on but disease activity is constant now. First diagnosis was “reactive arthritis”, then “maybe a combination of ankylosing spondylitis and Reiters”, then “undifferentiated inflammatory spondylosis”. Another doctor said psoriatic but “let’s call it RA as people understand that and the treatment is the same”. Another said I didn’t need MTX , it was just osteoarthritis – just opioids which I can’t take – so I didn’t see him again as inflammation levels were out the roof. So now it’s RA as an ongoing diagnosis, I’ll ask for a test to see if I’m still seronegative I think. For interest’s sake. Thank you Kelly for starting a discussion about this and for your amazing book. I have been diagnosed with inflammatory arthritis, with high inflammation levels at every blood test for over a year. Along with the debilitating pain, swelling and twisted fingers, I have developed nodules, and a number of other rheumatoid signs (as well as a family history) but my RF and anti CCP have always been negative so my doctor isn’t sure what to call me. I believe I have had a long “pre-clinical” phase, since childhood with severe worsening in my early 20’s and progressive decline since. Now 15 years later I am finally being treated with DMARDS and about to start biologics. Is JRA a seronegative form of RD? It’s all really confusing. To make matters worse, I have to push and advocate for every single test, every single scan, and sometimes I am still refused. It’s been years since my hips and knees have been looked at, and despite showing cartilage damage and inflammation noone seems to believe me that they’re worse and need to be looked at again. Same with my blood markers, RF & a-CCP haven’t been tested for years, but noone is testing them regularly, so what if they do become seropositive and it is missed, or even masked with medication? Is that likely? I am so confused and tired of having to find my own answers to everything. Meanwhile my suffering is quiet and of an unknown origin and I have no support, financial or physical. Thank you again for your book Kelly, it helps so much to hear about similar experiences to my own and makes me feel less alone and hopeless. I was diagnosed with diabetes and hypothyroidism in 2004. Shortly after that I was diagnosed with fibromyalgia. After two years with no relief, I went to a rheumatologist who specializes in treating fibro as well as RD. She tested me for RD, but test results were negative. After six months, she told me she thought I was seronegative. After X-rays, CAT scans, and MRIs, she ordered a nuclear scan. It confirmed that I had inflammation in my hips, so she diagnosed me with inflammatory arthritis. I took prednisone and every first line medication, but I could not tolerate them. In 2009, I was diagnosed with polymyalgia rheumatica and took more prednisone. Last year I had PLIF surgery on L3,4, and 5 and a bone spur removed. My diagnosis was spondylitis and DDD. Currently I am taking hydroxychloroquine for inflammatory arthritis, cymbalta and ambien for fibromyalgia, tramodol for pain, sythroid for hypothyroidism, metformin and Januvia for diabetes, and atorvastin for high cholesterol. I have been fortunate to have a GP and rheumatologist who treat symptoms for seronegative RD. Nope, when I showed up for my RF test I was so far off the charts, the docotr suggested we may want to rewrite the charts. LOL This is a great article. My seronegative RD was for many years very difficult to diagnose. For years, I had a very high sedimentation rate and severe pain, but no other signs of RD. I was diagnosed with fibromyalgia before most doctors believed it was real. Then, x-rays revealed that I had developed finger erosions and the so-called called autoimmune condition “undifferentiated connective tissue disease”. When none of the meds worked for me, my rheumatologist finally tried Embrel to see if I could have RD or not. Embrel.worked, and I was diagnosed as having seronegative RD. I since have had many flares requiring prednisone once a year for severe finger, wrist and elbow joint pain. I take Plaquenil, methyltrexate injections once a week and Remacade infusions every seven weeks as well. Who says seronegative RD is less severe than seropositive RD?